Since around 1995, there has been a federally mandated safety device inside of every Weber propane hose/regulator that’s designed to detect gas leaks. 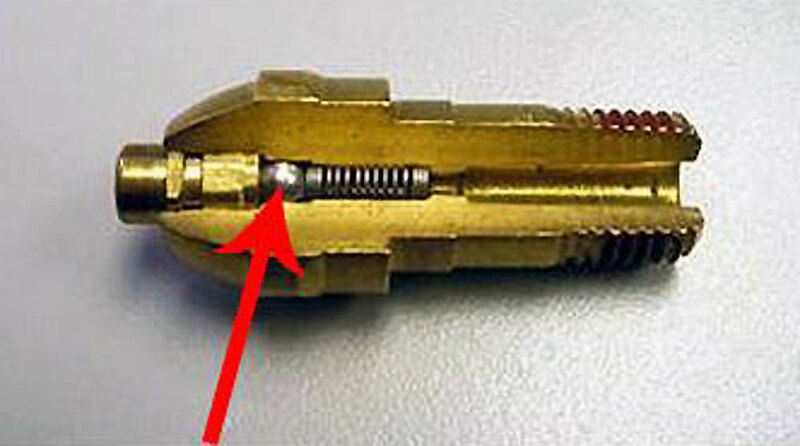 The photo below shows the inside of a regulator nozzle. The arrow is pointing to the safety device. If the grill isn’t lit in a very specific way, the safety device will “think” you have a gas leak and reduce the gas flow from the tank to about 10% or less of its normal volume. When this happens, we say the grill is in “bypass”. With so little gas getting to the grill, it will be impossible to get the grill up to its normal temperature range, or in some cases the grill won’t even light at all. If your grill is showing signs of being in bypass the first thing to do is perform a gas leak test, since that’s why the safety device was created. Click here for instructions on performing a gas leak test. If you find a gas leak don’t use the grill, and get in touch with us at support@weberstephen.com or 1-800-446-1071 and we’ll be happy to help. We are open 7 days a week. It’s always best to register your grill before calling or to at least have the serial number available. If they don't find a gas leak, the instructions below will get you out of bypass and will keep you from going into bypass in the future. Make sure the lid of your grill is open and all the control knobs on the grill are in the OFF position (including the side burner knob, if you have one). Turn on your gas supply by opening the valve on top of the tank. Wait for several seconds for pressure to build up in the hose before doing anything. The pressure is going to push the device into place to give it the “all clear” for normal operation. Waiting for the pressure to build up is the most important part of this process. Click here to see a short video demonstrating how the safety device functions. After you’ve waited a little bit, go ahead and light your grill as you normally would by turning the appropriate burner to start/high and hitting the igniter button. The actual lighting instructions may vary based on which model you own. Make sure to refer to your owner’s manual for details. Light all the main burners and set them to high, then close the lid. Give your grill about 10 to 15 minutes and it should be in the 500 to 550 F range, which means your grill is now working properly. To view a video version of these instructions click here. Cold weather can delay the time it takes to equalize the pressure, so if it’s cold outside make sure to give the hose/regulator some extra time to pressurize before turning a control knob to light the grill. If those instructions didn’t work there are a few other things to check. The "start" position that you use to light the grill is also the "high" position. The further you turn the knobs the lower you are setting the grill. Is it possible you are setting the grill to low instead of high? Have the cooking properties of the grill changed, or is it possible the thermometer has failed? Do you have gas in your propane tank? Is the hose/regulator properly secured to the tank? If none of the tips or instructions above have solved the issue please reach out to us support@weberstephen.com or 1-800-446-1071 and we’ll be happy to help get your Weber working properly again so you can get back to grilling! Why Won't My Gas Grill Get Hot?